If you are a novice in e-commerce, you may feel pretty insecure about where to start. I bet you don’t feel like spending lots of money for acquiring a custom design, and, probably, consider creating a website using a template. This choice is pretty wise and I totally agree that this is the right way to get things done. However, there are still many questions left: What kind of template should you go for? A PrestaShop one, a Magento one, a WooCommerce one, or an OpenCart one (I’m not even mentioning the less popular e-store engines)? The choice is pretty hard if you have no experience of working with any of them. You can’t buy 4 or 5 different templates to obtain first-hand experience of working with different template engines and to determine, which one best fits your needs. Don’t worry, there is a third way out, and this way is finding a free template to try your strength in working with this or that engine. Sometimes, it’s pretty hard to find a modern well-coded free template. Companies are reluctant to provide what they sell without profit. Only large template providers can afford to provide templates that are equal in quality to the premium ones to let people experience the greatness of their products before purchasing a premium item. In this post I share with you 50 best free e-commerce /WooCommerce themes of this year, to bring you the best solutions for starting your journey on the way to a perfect website without expenses. These templates were kindly provided by such awesome template providers as TemplateMonster, aThemes, Colorlib and WordPress.org. Go for WooCommerce if you want to create a small shop, and need a very simple solution. WooCommerce runs on WordPress, most popular CMS engine in the world, known for its simplicity and comprehensiveness. Go for PrestaShop if you want to create a small/medium shop that is both simple to manage and rich in functionality. Go for Magento if you want to run a large store with rich catalogue, or to run a couple of stores on one engine using multistore. Moreover, Magento has very strong SEO, so you can go for it because of this reason. Alternatively, you can go for Shopify, ZenCart, Virtuemart or osCommerece if you for some reasons prefer one of these engines. Checking the templates, you can learn more about each of them by pressing ‘Details’ link below the screenshot, or you can see how the template will look and function after installation by pressing on ‘Live Demo’ link. In Blossom is a perfect responsive template for a flower shop. It’s packed with a number of pre-built plugins, such as TM MegaMenu, TM Media Parallax, TM Products Slider, TM Mage Layout, etc. Fluffy Pet is a cross-browser compatible and well-documented WooCommerce template with intuitive installation and management, and extended product sorting options. This multilanguage and multicurrency template provides you with Swiper Slider with video slides, MegaMenu, top banner with animated counters for discounts, advanced zoom and Ajax search. Sweetest is the OpenCart template with rich Parallax backgrounds and elements of new gen flat design. The template allows you to work with multiple languages, currencies, and delivery methods, as well as add badges, and offer ‘Add to Wishlist’ and ‘Add to compare’ features. Simple to install and manage, TheShop is a multipurpose e-store solution with well-structured home page and responsive design. The template comes with a number of prebuilt pages and offers you rich color options. Ideal to the core, this clean and balanced PrestaShop theme brings all that is needed for a perfect beauty store: switch between list and grid category views, create slideshows and wish-lists, use FontAwesome icons and go multilingual. All this is possible with Clean Skin template! Visually rich and immersive, this fullscreen WordPress theme can be easily turned into the e-store for selling goods of any kind with WooCommerce plugin. Being a one-pager, Shapely is Retina-ready, responsive and cross-browser compatible. This sample theme for a clothes shop is packed with a number of enhancements, such as different category page layout options, product badges, Font Awesome icons, etc. Stylic is a harmonious free theme that lets you create an ideal web store without lots of headache. The theme brings you rich typography and color options. This theme is a rock-solid solution for building a houseware or kitchenware website. The template has clean, valid and well-structured code and meets DEO-guidelines of search engines, such as Google, Bing, Yahoo, etc. Iddly is a sleek and upbeat WooCommerce ready WordPress theme that boasts of skillfully crafted design and rich customization options. The template employes Parallax effect and rich UI elements to bring you customers perfect shopping experience. Having a contrasting color scheme of black, orange and white, the theme stimulates your site guests and motivates them to make a purchase. Home page slider and top banners are ideal to showcase your best offers and promos. Bright, clean and minimalistic, Ruby template is built with HTML5, CSS3, Bootstrap 4 and corresponds to the latest coding standards. The template is compatible with popular modern plugins, such as Jetpack, bbPress, BuddyPress, WP-PageNavi, Breadcrumb NavXT, Contact Form 7 and many others. Looking for a perfect free template for spot equipment store? StortShop is one of the best matches on the market, offering effortless installation, translation tools and energetic responsive design. Visually rich and Retina-ready, this template gives you complete layout control, and allows you to work with shortcodes that let you add content of different types to different website pages of your website. Fusing traditional and modern web design, this template with skeuomorphic wooden backgrounds creates the pleasing atmosphere of a brewery. This clean electronic store template would be also a perfect fit for the stores of other kinds. Thanks to Bootstrap 3, the template perfectly adapts to different viewports. If you need a tender template for a modern flower shop, this theme lets you showcase your best flower bouquets. The template features MegaMenu functionality that allows you to create large menu panels that include not only links to website pages, but also links to posts and categories, widgets and images. This violet-and-white template brings you feature-rich gallery page and filterable product catalogue. You can use multiple shortcodes to enrich your content display. Balanced and refined, this website design can be a perfect solution for your gift shop. The template features large animated slider, and animated banners, rich ‘Add to cart’ functionality and other intricate effects that make users want to stay on your website. Dark background and neon colors allow creating a glowing modern sport equipment e-store. The template supports such features as Wishlist, Compare and Quick View. This fully editable template offers working with different post formats, such as aside, gallery, link, image, quote, audio, video, etc. The template is WPML-ready, so you can go multilingual in no time. Rich gradients and use of negative space account for ultra-modern design of this gadget store template. The template is SEO-friendly and compatible with popular third-party plugins. Add Mega Menus, Parallax and video backgrounds to create a high-converting clothing store with the help of this well-thought and balanced template. MyStyle is a lightweight and clean WooCommerce template developed for small stores of different kinds. The theme has a custom homepage and allows you use shortcodes for quick content management. Delicious and tempting, this sweets template features a fullscreen banner with your most tempting products. The theme is feature-loaded and will be a perfect platform to broaden your web design expertise. This clean and interactive template offers you rich customization and smooth performance. The theme includes a fullscreen slider, wide and boxed layout options, customizable fonts and rich color choice. Olive green and dark brown colors, used in this template are reminiscent of typical coffee beans shades. With the template, you can launch your online store within a short period of time and offer you coffee products to a broader audience. Slanting lines and geometrical shapes are the ones to name among the visual attractions of the website. Ajax live search, product Quick View, and handy zoom will boost usability of your website and make users come back to your website. Dimmed color palette of this template, combined with the use of negative space creates a modern space for favorable presentation of your home electronic supplies. This fitness template of simple motivating color invites you create a smooth-functioning e-store with product badges, different layout types and multilanguage support. Slanted dividers, stylish circle banners, and extended color palette create the unforgettable design of this WooCommerce template. This one page theme with impressive portfolio section and immersive Parallax will win over the hearts and minds of your clients. Need an exquisite and elegant template for your clothes store? Go for the new Algibro theme. The template is WPML, RTL, and SEO-friendly. This template will please you and satisfy your needs if you intend to sell products of agriculture and farming. The template has an extremely handy shopping cart that unfolds in form of a dropdown on hover. Satory is a template with some light eastern flavor to it. It comes with a number of prebuilt plugins that include SitOrigin’s Page Builder and Widgets Bungle. If you enjoy working with Joomla, this template lets you run a VirtueMart shop with Joomla as an engine. The template is multilanguage and multicurrency, so you can reach for the world with it. Ultra-clean and sleek, this sport shop template boasts of such attractive visuals as animated counters and sliders, New and Sale badges, More Info and Quick You buttons, and much more. Blue is one of the traditional colors for gadget stores and here it gets a new fresh incarnation. Your users won’t have to look for your contact details and social sharing buttons as they are handily situated in the website header. This maintenance services and spare parts template was designed using classic colors and minimalist background. Navigating your website will be a real piece of cake thanks to MegaMenu used in the template. This free theme was developed for different stores selling accessories or gadgets. Template’s home page features a grid of cards of different shapes and colors that create an intricate and visually appealing mosaic. Ultimately feminine, this template provides for a pleasing shopping experience, during which every woman can relax and release her inner princess. Are you looking for a colorful and upbeat template to sell products to children and their parents? This lively template brings you all you need and even some nice-to-have extras. Want to spread style and fashion around the globe? This dream won’t be too ambitious with this brilliantly executed clothing theme. Breathy and minimalistic, this template looks equally appealing on all screen from small (smartphone) to large ones (PC). Reserved and uncluttered, this template is appealing to smart shoppers that don’t go for all that is blatant and screaming. The theme is extensively documented, so you won’t ever be lost. This minimal pure-white template makes your products the main attraction of your website. If you are a fan of down-sized, uncluttered design, this template is the best choice for you. Modern solution for an electronics store with multiple product filter options and extended product search. Black and red is an optimal color combination for a cars market website. On the left, you’ll find an illustrated category widget, which is a handy tool for searching a perfect car. This elegant and creative template with rich background is filled with a bunch of customization settings all built neatly within the WordPress Customizer. 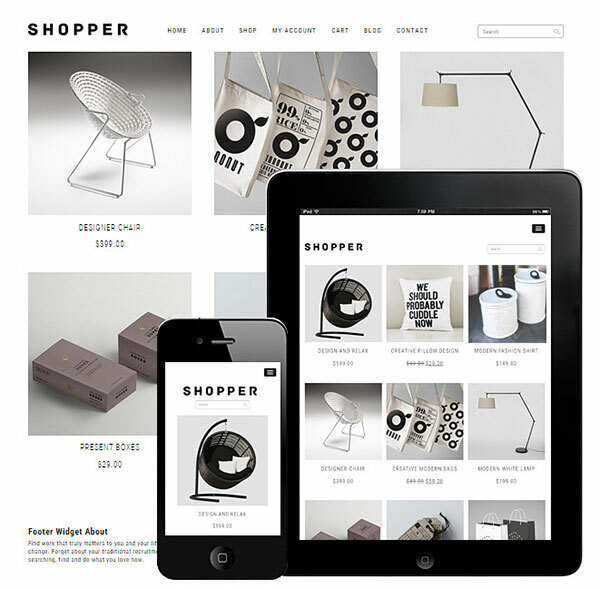 Shopper WooCommerce Responsive WordPress Theme is the best solution for your ecommerce online business. It has a modern three column layout design with clean layout. It is the best responsive ecommerce wordpress theme in our collection. I hope reviewing this collection was a pretty exiting experience and you were able to find the template that fits your needs and vision. Though, if you feel that you have got not enough knowledge or skills to install and customize any of the templates mentioned – you can always take advantage of a Service Center and professional specialists will do that for you. I wish you good luck learning to work with different e-commerce engines! If you have any questions or comments, drop a line here and I’ll be back with an answer.